One of my clients recently asked me to make these chocolate shortbread cookies for her, and a friend of hers asked for the recipe, so I’m posting it again now. I’m headed out of town this weekend to compete in the 20th annual Onion Man Triathlon in Walla Walla. I did a lot of triathlons several years ago, but for the past couple of years I’ve mostly focused on running marathons. Now, I’m trying to get back in triathlon shape, with the ultimate goal of doing a the Ironman 70.3 Calgary at the end of July. Hope everyone has a good weekend, I’ll let you know how it goes next week. Combine flour, cocoa, salt and baking soda in a bowl and whisk. Sift if there are any lumps in the cocoa powder. Using a stand mixer with a paddle attachment, beat the butter and sugars on medium speed until very smooth–about 3 minutes. Reduce mixer speed to low and add the vanilla. Add the dry ingredients and mix just until they disappear into the dough. Fold in the cocoa nibs and chocolate chips with a sturdy spatula. Preheat oven to 325°F and line two baking sheets with parchment paper. 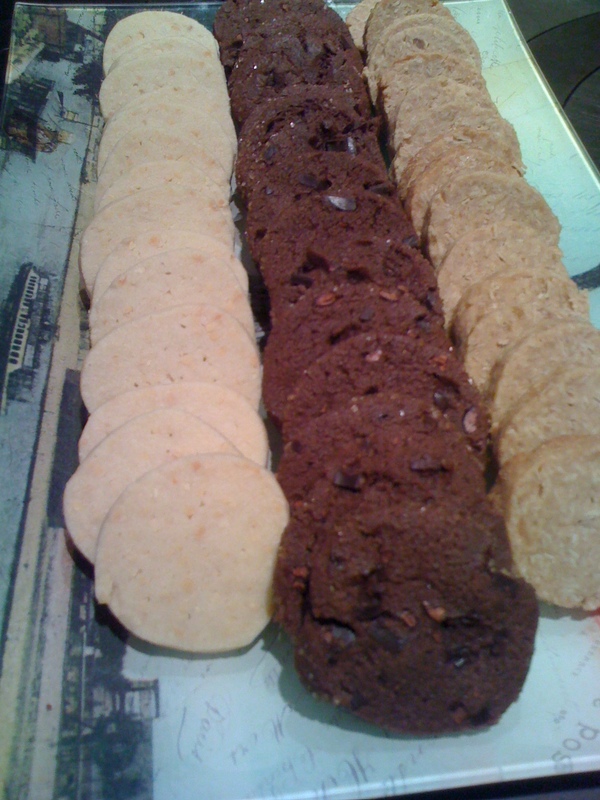 Slice cookies ¼- to ½-inch thick and place them about 1 inch apart, in 3 or 4 rows, on prepared pans. Bake 15 to 20 minutes, rotating the pans halfway through the baking time. The cookies should be firm to the touch. Recipe from The Grand Central Baking Book by Piper Davis and Ellen Jackson (Ten Speed Press, 2009). This entry was posted in Desserts and tagged Baking, Chocolate. Bookmark the permalink.